The dam site was located on Spring Creek in Harney National Forest--directly east of U. S. Highway 85A (now U. S. Highway 385)--3 miles north of the junction of U. S. highways 16 and 385, 6 miles northeast of Hill City. 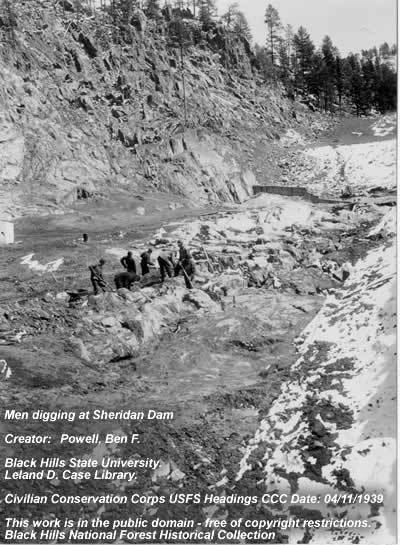 The only written report located about the camp was entitled "Construction History and Technical Details of the Sheridan Dam", written by Ben F. Powell, general superintendent in charge of construction of Sheridan Dam. It appeared in the December 1940 issue of The Black Hills Engineer. It is quoted here. "The original program provided for the construction of two camps on the site, work to commence June 1, 1938, and continue for 2 years using the personnel from the two camps. 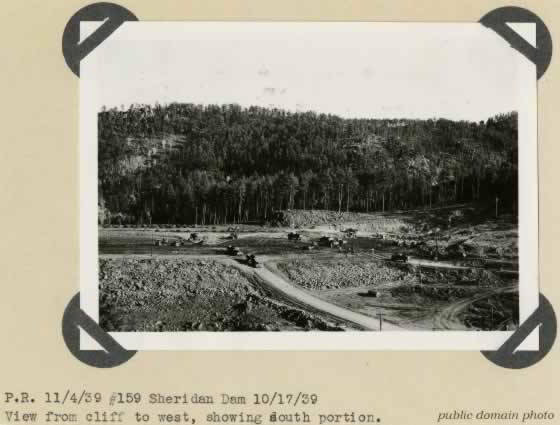 "Approval of the Sheridan Dam project was given by telegram on August 13, 1938, and work was started August 14, 1938, using enrollees from Mitchell side camp and enrollees transported by truck from Tigerville and Custer camps." Powell continues, "On February 24, 1939, the establishment of a main camp, F-24 (Sheridan), was approved and construction began March 12, 1939. This camp was not occupied until June 13, 1939. After this date the personnel for the construction was furnished from Camp Sheridan, augmented by a detail of 50 men from Camp Pactola (in 1940). "One General 3/4-cu-yd shovel and two Caterpillar 60-H.P. diesel trailbuilders arrived on the job August 17. A ditch to divert Spring Creek from the valley floor was begun the same day. 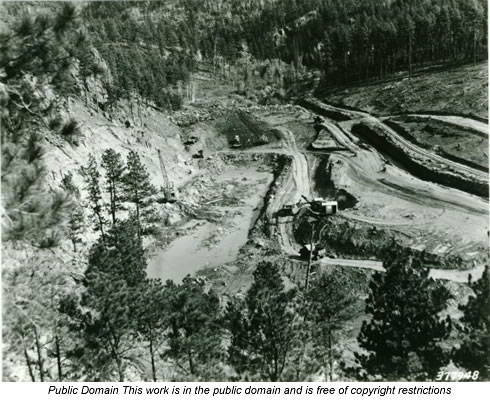 A section of the dam for Spring Creek diversion was used for the relocation of the logging road as well as a road to and from the dam. This diversion dam and diversion ditch were completed August 23, and traffic on the Warren­Lamb Railroad was stopped at 10 a.m. The log train schedule of 2 days per week was not disturbed; the relocation of track was completed August 26 at 10:30 a.m., and operation of the logging train resumed at that hour. 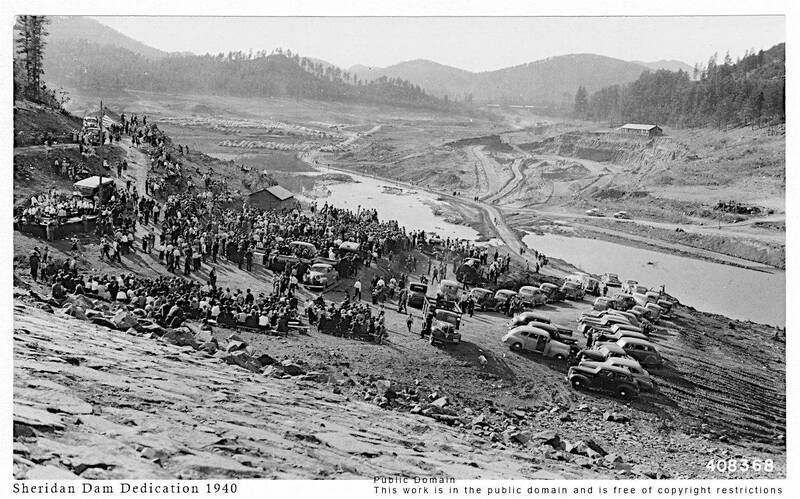 "On Monday, August 19, 1938, excavation on the dam proper began. The first work was the construction of an open drain from a point 300 ft below the dam to the lower slope stakes. From this point to the center line a 4-inch bell and tile drain was laid. The unfit material was removed from between the lower stakes and the center line, and the filling of this area was begun with suitable material excavated from the upstream half of the base of the dam. Plans of the structure called for the removal of all overburden and weathered rock to solid impervious bedrock in the section between the center line and the upstream toe. "A 1-1/4-cu-yd Northwest diesel shovel arrived on September 8 from the Bighorn National Forest. This machine was used as a shovel on excavation until late in the month when it was necessary to convert it to a dragline for bottom cleanup. Stripping from the north abutment up to elevation 4,560 had been brought down by shovels prior to the time the bottom cleanup began. On October 28, 1938, fill operations were practically shut down for the winter and exploration and excavation thus far made possible the preparation of a plan for complete grout drilling. The concrete cutoff walls were pushed to completion in December across that section of the base uncovered to rock. "About October 1, 1939, the available impervious material in the Dickinson pit, which lies near the old residence a mile west of the dam, played out and the larger shovel was moved to the Mallory Gulch area. The small shovel, however, remained in the Dickinson pit to load pervious material. The amount of material excavated from the. . . pit was over 250,000 cu yd. "Heavy freezing set in November 12, 1939. When the job shut down November 15, there were 12 to 15 inches of frost in the south end of the dam. "By April 1, 1940, the winter had released its grip to an extent that it was deemed possible to begin work on the dam. The earth surface on the fill proper was still frozen to a depth of several ft, and this frost did not leave until about April 15, 1940. Between April 1 and 15 the men removed the remaining fractured rock from the abutments, and repaired all roads from the borrow pit to the dam over which the material was to be hauled. "On June 24, WPA work, which consisted of the tunnel, spillway and stilling basin, had advanced to a point where pouring could be started on the walls of the stilling basin. The operation of placing this concrete lasted until September 13. From then until November 1 these crews were busied with the construction of fish ladders and the rock apron which were apart of the stilling basin. "The design of the dam called for two berms placed at the one third points on the downstream slope. These berms were 8 ft wide and each was fitted with a concrete drain 1 ft deep and 2 ft wide which ran from the north to the south along the dam. These drains will carry rain water collected from the slopes out on to the grass and tree land at the ends of the drains. This prevents erosion which would result from rainfall on the undivided slope. The lower berm drain was begun on June 26 and completed August 8. It was 350 ft long. The work on the upper berm drain was begun on August 14, completed on about September 17, and it was 650 ft long. "Filling operations on the dam were completed on August 19 and immediately thereafter gravel was placed upon the upstream section of the dam preparatory to beginning the section of rip rap which was finished to an even grade. Rip rap below 15 ft was dumped on the fill and leveled by bulldozer. Placement of the gravel required 2 days and was completed on August 2l. Between August 21 and September 15 the downstream slope of the dam was covered with soil and seeded to grass. It had reached sufficient height to give a green cast to the structure and a very pleasing appearance by October 15. "On August 22, 1940, the work of placing the smooth, hand placed rip rap on the upper 15 ft of depth of fill was started. It continued during August, September, and October. The rip rap varied in size from one sq ft in surface area to 2 or 3 square yd and was placed largely by means of cranes which were attached to the 3/4-cu yd General shovels after the booms and dippers were removed. This rip rap was capped by a stringer of rock 12 inches wide with a minimum thickness of 8 inches which ran parallel to the axis of the dam and along the upstream edge of the crown of the fill. Some of this rock had to be hauled a distance of over 15 miles as the ordinary quartzite in the near vicinity did not have fracture planes which would produce a laying rock of the required dimensions. "Under the auspices of the Rapid City Chapter of the Izaak Walton League of America the dam and lake were dedicated to the use of the public on October 20, 1940. Special representatives from the Civilian Conservation Corps, U. S. Forest Service, WPA, Izaak Walton League of America, Fish and Game Commission of South Dakota, and from the United States Congress were present. A crowd estimated at more than 5,000 people attended. "The lake covered 380 acres, had 7 miles of shoreline, and contained 12,000 acre-feet of water to a depth of 35 ft. It was 126 ft high from lowest point in the bedrock to the crest that was 850 ft long. The base was 675 ft wide at the rock level. Material included 575,000 cu yd of embankment, of which 35,000 was rock and 11,235 yd of rip rap, of which 3,300 was hand placed, in the upper portion of the dam. There were 3,000 cu yd of gravel cushion under the rip rap, 575 yd of concrete in the cut­off walls, and approximately 1,200 cu yd of other concrete including the spillway and stilling basin. Other construction items included 8 acres of clearing at the dam site, 100 acres of clearing in the lake basin, 12,000 cu yd of stripping in the borrow pits, 650 ft of tunnel, and 500 cu yd of cement­laid rock masonry. The spillway had a flow capacity of 2,000 cu ft per second. 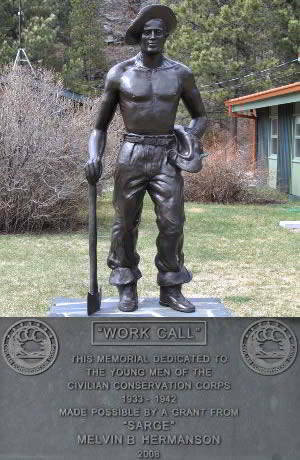 Over 71,000 man-days of CCC labor were required to build the dam and 2,000 to clean up the lake basin (BHE-40). Sheridan Dam was the largest earthen dam built by CCs in South Dakota. It surpassed the Crow Creek Dam at Chamberlain, that had that distinction for over 2 years, in height, width, and amount of material used; but was about 400 ft shorter. In 1940 it was surpassed in size by only one other dam in the state--Orman Dam at Belle Fourche.